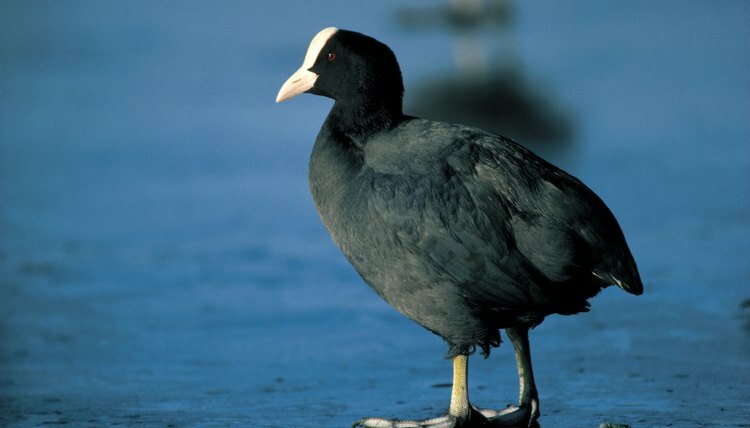 The American coot, also known as the mud hen, is a duck-like waterbird. It is a common bird in the U.S. and is closely related to rails and crakes, belonging to the same order as cranes. Ohio's minor league baseball team is also known as the Toledo Mud Hens because of the high population of American coots that lived near the team's stadium in Bay View Park. The mud hen grows to around 14 inches in length, has a wingspan of almost 28 inches and weighs over 31 oz. It is black to dark gray in color with a white patch below the tail. The bird's beak is white with black markings near the tip, and is triangular in shape like that of a chicken. The feet are not webbed like a duck's, but have large, broad, separate toes that help the bird to swim. Its wings are short and rounded at the tips so it is hard for the birds to take off, but once airborne they are good flyers. The bird is found year-round in the western and south-central regions of the U.S. During the winter months, the birds migrate to the southeastern U.S. and into Central America. In summer, migration takes them further east and north into much of Canada. It is a fresh water bird that can be found near ponds, lakes and marshes, either natural or man-made. The bird is also sometimes seen in tidal marshes where water is more salty. The mud hen is an omnivore, eating both vegetation and aquatic insects. The bird will dive underwater to gather clumps of aquatic plants, which it brings to the surface. It then picks through the vegetation for the edible plant parts. Small fish and tadpoles are also part of the bird's diet. The main predators of the mud hen are osprey and bald eagles. The bird is helpful to other animals as a danger alarm: If it senses or spots a predator, it makes loud warning vocalizations and splashes around wildly in the water. The mud hen lives in large flocks and is the only member of the rail family to do so. Within the group, short-term breeding pairs develop for mating around May to June each year. Both the male and female help to build a floating nest, which is anchored to upright aquatic plant stalks. The female generally lays between eight to 10 eggs in each clutch and can nest twice in a season, given ideal conditions. Both parents help incubate and care for the chicks. Eggs hatch after around 23 days and are independent after two months. In the wild, the birds can live for around nine years.